Dancing, shows, cocktails, an excuse to finally whip out that itty-bitty dress you love, but can’t ever bring yourself to wear because it’s just a little bit too risqué. Is it any wonder Las Vegas is the quintessential girlfriend getaway? To make sure you do it right and take Vegas by storm with your best girlfriends, here are some dos and don’ts for a girls getaway to Vegas. Don’t: Accidentally end up off the strip. If booking online, make sure you research where the hotel is that has the best deal as there are some popular hotels that are located a mile or two off the strip – and do you really want to be away from all the fun on a girls getaway? Girls Getaway VIP Tip: Choose your weekend to visit Vegas carefully. Conventions and holidays can mean much higher prices than other times of the year. 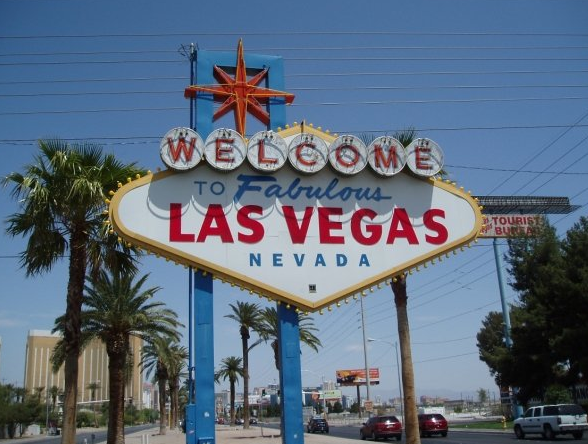 You can check convention schedules on http://www.lasvegastourism.com/lasvegas_conventions.htm. Go during a slow time of year and you may find yourself finding a stellar deal on a balcony room with a hot tub – or even an upgrade when you check in. Do: Bring sunscreen – and remember to lather it on every hour. Don’t: Deck yourself out in make-up and perfect hair. Don’t you want to have some fun in the pool? Do: Drink lots of water. With party hosts running around dumping shots in willing participants mouths, you don’t want to get sucked into the drunk and disorderly category. Don’t: Arrive to the pool too late – all the good chairs will be gone. Girls Getaway VIP Tip: Check the pool cabana rates at the resorts. Many are “free”, but have drink and food minimums you have to spend in order to reserve. If you have enough girls, the total cost you each spend will probably come out to what you would have spent anyway on drinks and food. Don’t: Plan on what club you’re going to last minute. Unless you really have faith in the fact that your group will be VIP’d and ushered to the front of the line, some minor planning is required to prevent standing in a long line in 3 inch heels. Do: Walk the strip for a bit during the day. If you’re in a group of all girls, chances are you’ll have numerous “Ladies Free” offers from the many peddlers gracing the strip trying to get visitors to go to their club that night. Get on a few different lists if you can, so you have some to choose from later on. Do: Show up on time. If the club rep said to get their by 11pm, you’ll probably want to do that or a) risk being in a line or b) have to pay to get in. Remember, they’re doing this all day – there’s going to be a lot of girls on that list so being on a list or having a card or wristband doesn’t automatically mean you’ll waltz to the front of the line. Don’t: Pick a lounge if you want dancing, and vice versa. Girls Getaway VIP Tip: Got a bachelorette as part of your group of girls? Veil and sash her up and use her as your ticket to the front of the line. It doesn’t always work, but hey – it’s worth a try! Do: Take turns cheering each other on. Watching a friend play blackjack or hit slot buttons can be just as entertaining as playing yourself – and if you each take turns playing and cheering each other on, you’ll have times you’re not spending your money. Plus, if you have a levelheaded friend, she’ll push the “cash out” button for you before you spend all your money on the $1 slots. Don’t: Spend all your money on the $1 slots – or any slots for that matter. Yes, you might be the lucky girl who wins big that weekend, but chances are you won’t be. And a girlfriend getaway is not the time to go broke – your friends aren’t going to want to hear you moan about the money you lost and have to loan you food money for the rest of the weekend. Do: Spend time on the penny and nickel slots if you just want the experience of gambling. Bid low and your money will last awhile – maybe. Do: Set a budget for yourself and stick to it. Tell that responsible friend what your budget is, i.e. will not spend more than $100 gambling this weekend, and ask her to help you stay within it. Girls Getaway VIP Tip: If you do end up gambling for a while, make sure you take advantage of the cocktail servers wandering around offering free drinks for gamblers. Hint: They don’t frequent the penny and nickel slots very often. You may need to take up one of the card tables. Do: Check out the buffets. For not much money, you get an enormous heap of scrumptious food. Don’t: Only go to the buffets. There are many amazing restaurants in the casinos and resorts of Vegas. Do: Make reservations. The popular restaurants in Vegas fill up fast on the weekends. Don’t: Put off eating so long that you end up only going to the food court and eating Subway or McDonald’s because you have 30 minutes to get to a club before there is a cover. Girls Getaway VIP Tip: To really feel like a rockstar – and if you have funds to spare – try the Jasmine restaurant in the Bellagio, which offers views of the Bellagio fountains while you eat; or the Eiffel Tower restaurant, which is elevated on top of the casino on the “first level” of the tower with great views of the city and amazing food. Put on those dancing shoes, grab your besties, and let the fun of Vegas begin! David: We both know the place from the inside, though decades apart.Larry: Nice to agree.Mitch: I’m far away from Fox, as you already know.Snarky: Do I sense a glimmer of hope in your last paragraph.So unlike you.